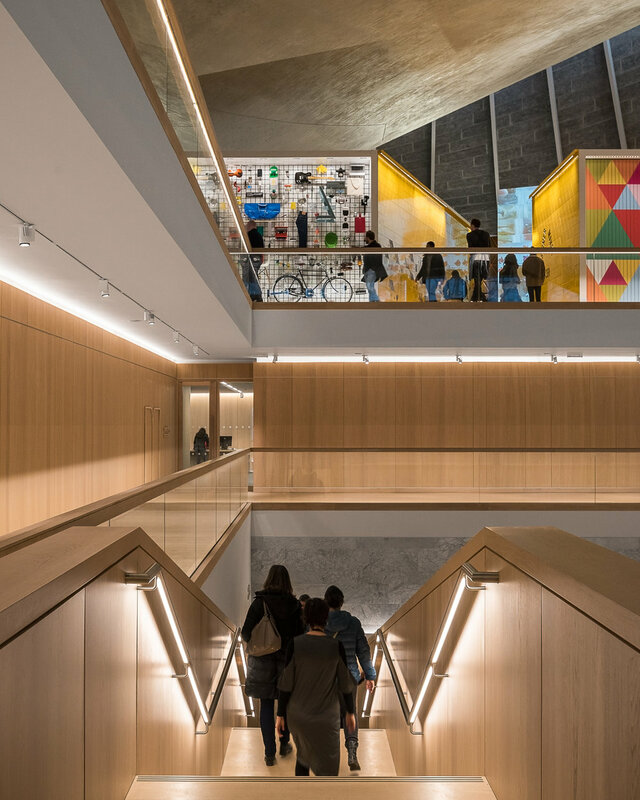 Here is a personal architectural photography project I recently undertook, of the amazing new Design Museum in Kensington, west London. 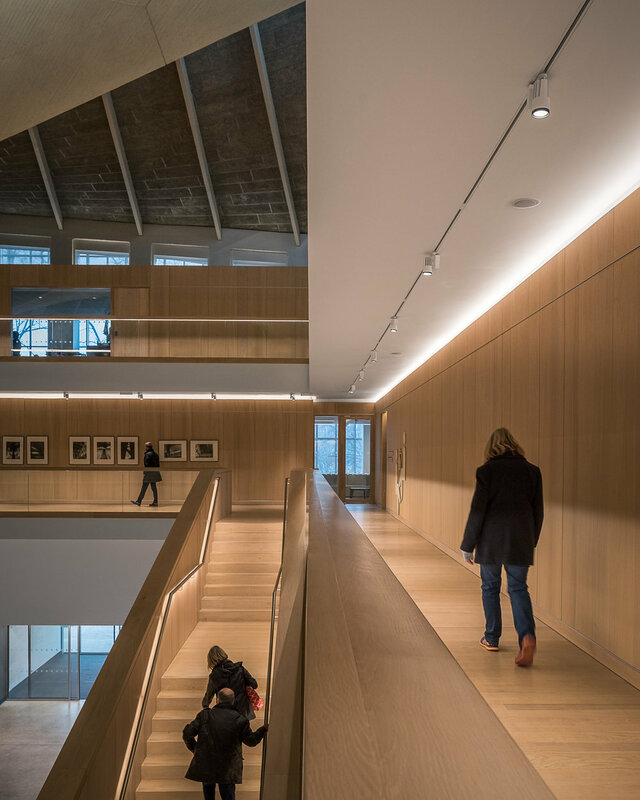 Interiors by John Pawson, architecture by OMA and Allies and Morrison. 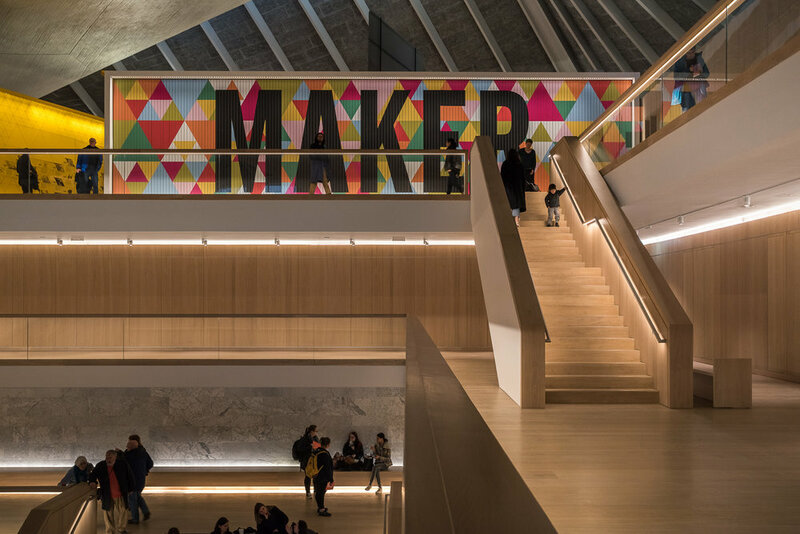 I recently visited the stunning new transformation of the 1960's London Commonwealth Institute into the new base for London's Design Museum (previously located near Tower Bridge). 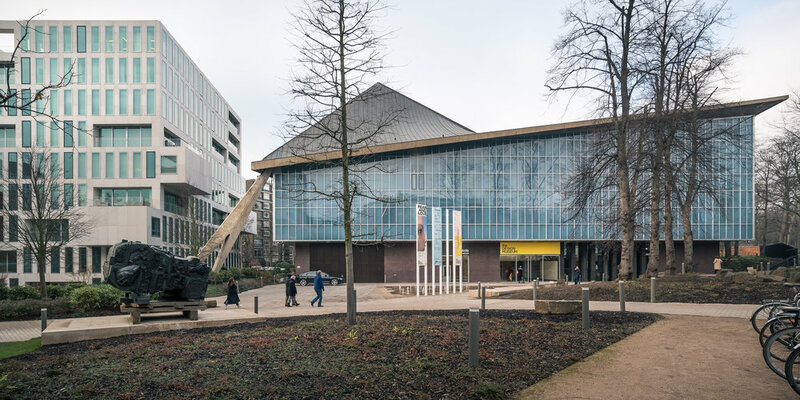 Architects OMA (Rem Koolhaas) and Allies and Morrison were jointly responsible for repurposing the old structure and bringing it back to life for this new purpose. 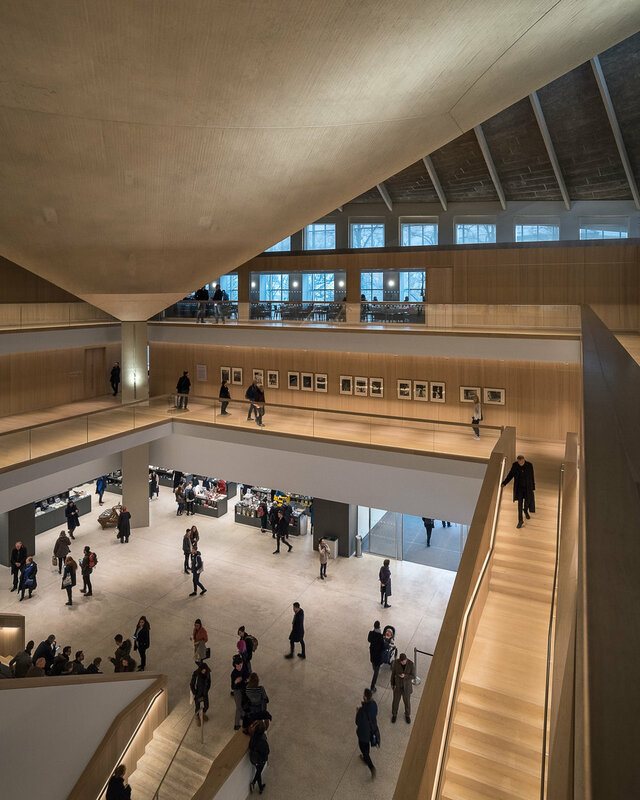 The centrepiece of the structure is a fantastically beautiful and complex copper-covered hyperbolic paraboloid roof, which contains triangular skylights that throw in lovely shafts of daylight down into the new interior by John Pawson. 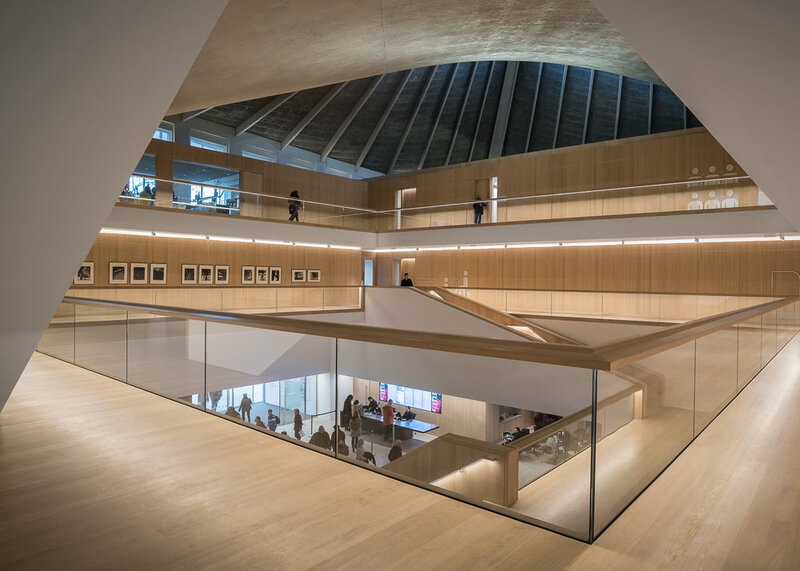 The new interior consists of a vast oak-panelled atrium in the centre of the building, around which the exhibitions are housed. 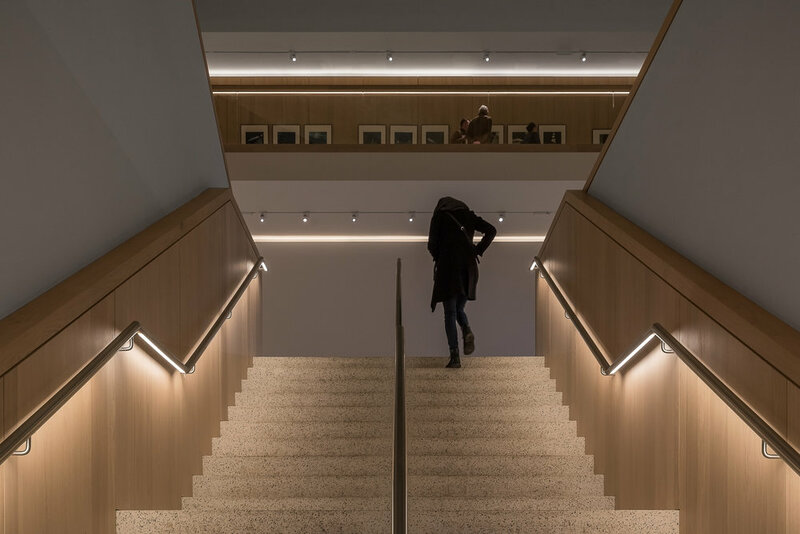 The atrium is flanked by walkways on each of its three levels. 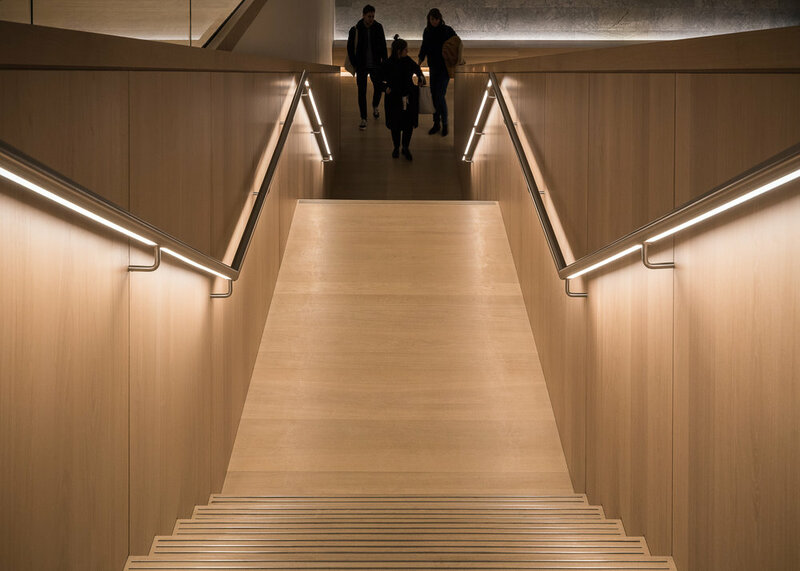 These walkways are linked by staircases and the combination of these elements produces a host of striking but simple intersecting lines, accented by strip lighting under the handrails. Looking up, you then see the amazing vaulted jutting out from and curving over the space at a 45 degree angle, creating some amazing shapes and textures. I decided to take a trip there to see the design for myself and make a personal photo project, as the subject really intrigued me, and I knew that it would make some great photos. I was not disappointed! 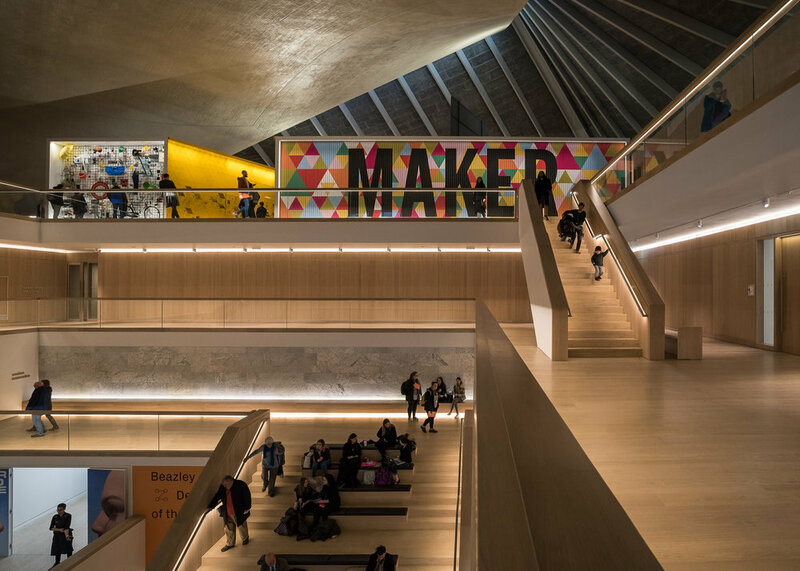 It is an amazing space to be in, with photo opportunities everywhere. 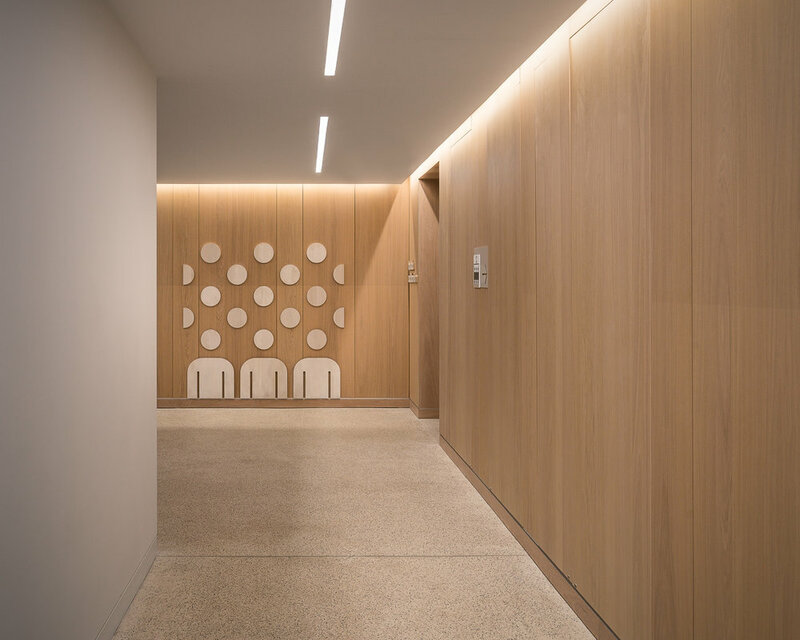 For the exterior photos, I wanted to show off the striking curved roof at its most bold angles and contrast it with the cube-like Hollandgreen private residential development by Allies and Morrison which partially surrounds the site. I love the way the straight edges of the residential blocks are juxtaposed by the sweeping curves of the museum's roof. 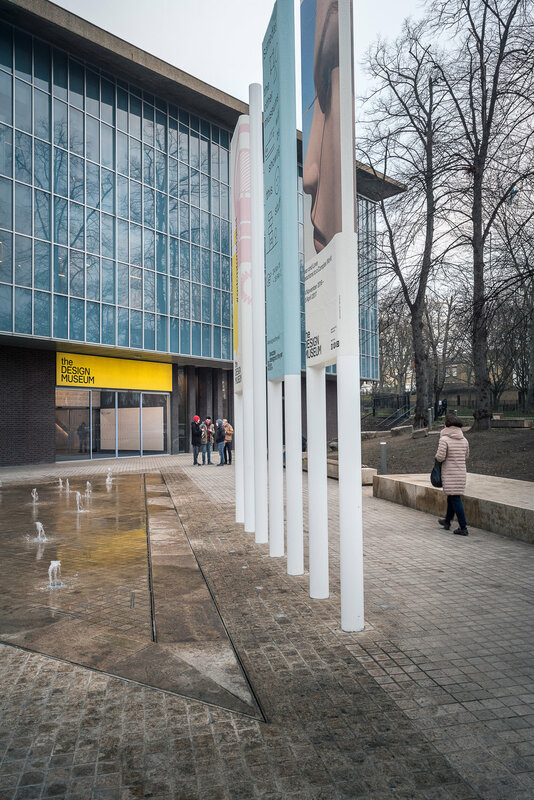 The Hollandgreen buildings also act as a great frame for the museum's exterior as you enter the site from Kensington High Street. The interior was real a feast for the eye. My aim with the interior photography was to find the compositions that really showed off the lines at their most elegant. I loved the mixed colours of light in the space caused by the warmth of the oak panelling and concrete ceiling contrasting with the blue late afternoon daylight coming in through the skylights and filtering down across the vaulted roof beams. 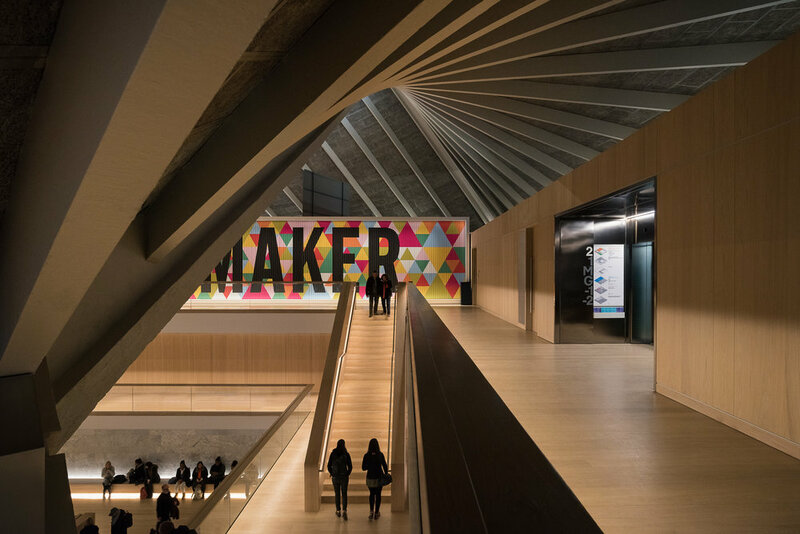 Another element that I wanted to highlight was the contrast between the straight lines of the John Pawson interior and the curves of the 1960s roof. This made for some very strong and graphical compositions, despite the size of the building. 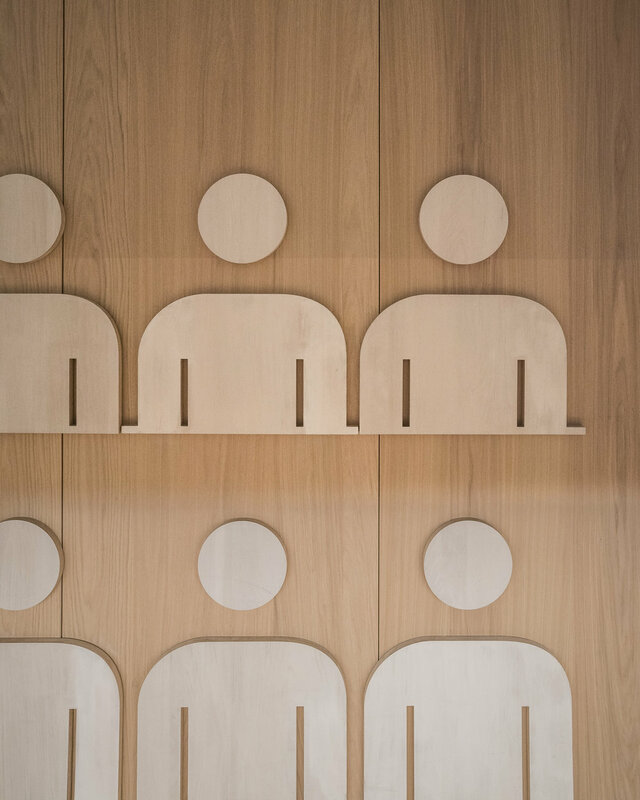 In addition, I really wanted to show how people were using and enjoying the new space, and so I made sure they featured heavily in the photographs. 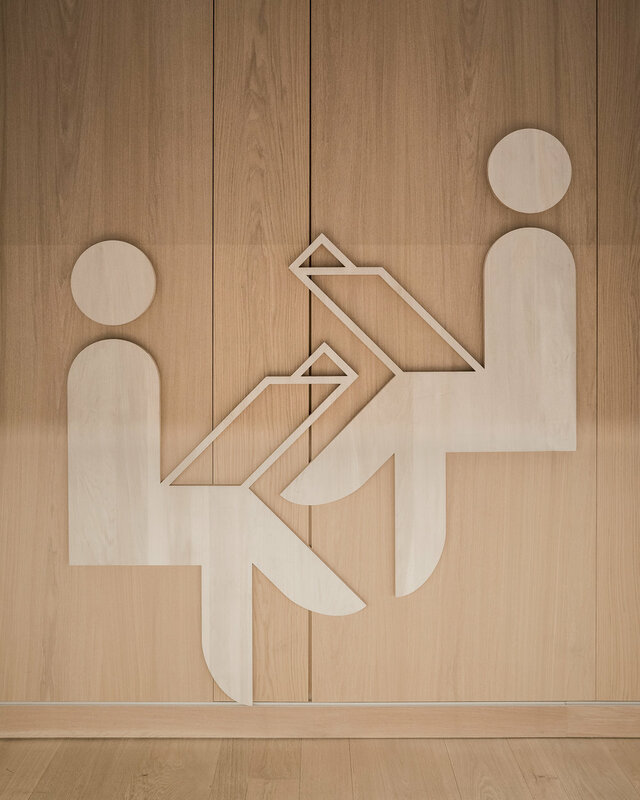 Finally, I was impressed by the very simple and graphic signage on the wood panelled walls and I focused in on a few of these to show the painstaking attention to detail that has gone into making this space so uplifting to be in.